It’s been a while and without wasting much of your time today,I will be briefing you or let me say updating you with a plant I call “JATROPHA CARCUS” which I do refer to as WEALTH CREATION plant because of its SEED vast uses and advantages ranging from production of soap,cream etc and most especially used in the production of biodiesel which has been in motion for so long though. 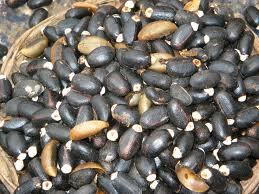 Aligned to the left side of this page are the seeds of Jatropha when in fresh and dried states.You need to take good note that the black seed is the main seed extracted from its capsule. Lest I forget,some communities refer to this plant as “LAPALAPA” and don’t be amazed finding this plant around your communities of which I’m glad telling you today that you’ve been ignoring wealth. Now that you’ve learn a little about this so-called plant,let’s go more into exploiting into usefulness of this plant. 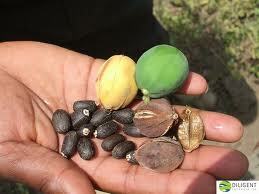 Biodiesel can now be obtained successfully from Jatropha curcas plant in Nigeria. This will enhance wealth and job creation opportunities for millions of souls through farming and processing of the seed harvested into biodiesel. Jatropha is a genus of approximately 175 succulent plants,shrubs and trees, from the family of Euphorbiacene.The name is derived from the Greek words (arpo’c(iatros) meaning “physician” and I’oQn’(trophe) meaning “nutrion” hence the common name physic nut. In 2007 Goldman Sachs cited Jatropha curcas as one of the best candidates for future biodiesel production. It is resistant to drought and pest and produces up to 27-40% oil averaging 34.4%.The remaining press cake of Jatropha seeds after oil extraction could also be considered for energy production and manure for our farmers.The rail between Mumbai and Delhi is planted with Jatropha and the train itself uses up to 20% biodiesel.According to Harry Stourton business development, director of Uk-based Sun biofuels, which cultivate Jatropha in Mozambique and Tanzania, it does grow on marginal land, but if you use marginal land you will get marginal yield. Biodiesel is the name of a clean burning alternative fuel,produced from domestic renewable resources. Biodiesel is simple to use. It is biodegradable, nontoxic and essentially free of sulfur and aromatic. Biodiesel is made through a chemical process called TRANSESTERIFICATION whereby the glycerin is separated from the fat or vegetable oil. The process leaves behind two products—methyl esters (the chemical name for biodiesel) and glycerin(a valuable byproduct usually used in soap and other products) To make a long term business opportunity, attention must be given to the critical issue of availability of the right feedstock at the right cost. Jatropha and other nonfood feedstock will be a vast source of biofuel and a key to reducing our dependence on fossil fuel(i.e. diesel from crude oil). 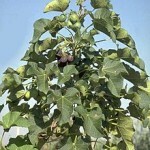 Jatropha can bring significant environmental benefits. It can replace jet fuel and diesel from petroleum without interfering with food crops or leading to the clearing of forests. The good thing about Jatropha is that you are producing a tree shrub that lives for a long time and does our job of producing oil while it also sequesters lot of carbon dioxide from the atmosphere. Jatropha is a valuable multi-purpose crop to alleviate soil degradation ,desertification and deforestation which can be used for bio-energy to replace petro-diesel ,for soap production and climatic protection and hence deserves specific attention . Jatropha can help to increase rural incomes ,self –sustainability and alleviate poverty for women, elderly, children and men, tribal-communities and small farmers. It can as well help to increase income from plantations and agro—industries. 1. Wasteland Reclamation and Reforestation. 2. Income generation from previously unusable lands. 3. 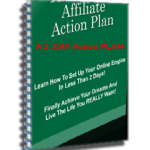 Provide huge opportunities from new sustainable and renewable land resources. 4. Creating employment through nursery development,soil preparation, plantation maintenance, seed collection,oil extraction and biodiesel production.The oil can be combusted as fuel without being refined.It burns with clear smoke –free flame, tested successfully as fuel for simple diesel engine. 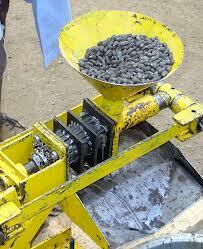 The by-products are press cake, a good organic fertilizer. The oil contains also insecticide. It is found to be growing in many parts of the world, rugged in nature and can survive with minimum inputs and easy to propagate. It is often considered that a more effective extraction technique would yield greater qualities of oil. This is partly inaccurate, since an effective extraction method would only yield optimum quantity and not more than that. The optimum oil content in Jatropha plant varies between speciesand genetics variant, climate and soil condition generally affect the yield of the oil as well. Prolong exposure of seed to direct sunlight can impair the oil yield considerably.This is usually done using different Jatropha oil extraction machines.Jatropha oil can be extracted from the seeds by two ways. Now!What do you think are the advantages of the above said update? 1. Creation of employment for millions of souls. 2. Increase provision of food through intercropping. 3. Biodiesel can be use for generation of power, for cars, generators and for cooking. 4. The cake can be used as manure and animal feed. 5. Create Health related solution(insecticide, antiseptic cream and soap) and many more. WHAT ARE YOU NOW THINKING NOW? Going into planting the seed? Going into processing the seed into biodiesel and other products? 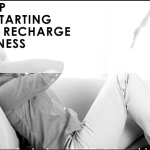 are there for you and as well equipped to get you started.